So you’re vegan and you want to eat like the good old days, only better! Well have no fear as there are now loads of vegan eateries that sell fast food; from places serving chill-cheese dogs to pizzas that are popping with more toppings than you can imagine. We look at the best cruelty free fast food spots in the country. V Revs is a Manchester based business that has grown in popularity to the point where it has a large, fancy new premises in the heart of the Northern Quarter. They sell hand-formed beefy patties and their deep fried chicken burgers are made from seitan (wheat gluten), with wheat free options available too. A typical burger at V Revs is quite the beast! For example, the BBQ WITHOUT U burger is made from a beefy patty, vegan cheese, brisket, onion rings, chipotle cola BBQ sauce, ranch and pickles. The food is served in retro ‘Americana-style’ baskets and they also sell fancy cocktails and a range of tasty sides that more than make up a main meal if you don’t have the biggest appetite, or are on a budget. Vx, or V-cross, is a one-stop shop for vegans located in King’s Cross, London. Open 7 days a week, Vx serve up a full junk food menu featuring cheese toasties, quesadillas, hot dogs (or ‘Hell Dog’ as one is named), kebabs, burritos, burgers, desserts and even a sneaky salad option at the bottom of the menu. Vegan fast food lovers certainly aren’t short of places to eat in Bristol! 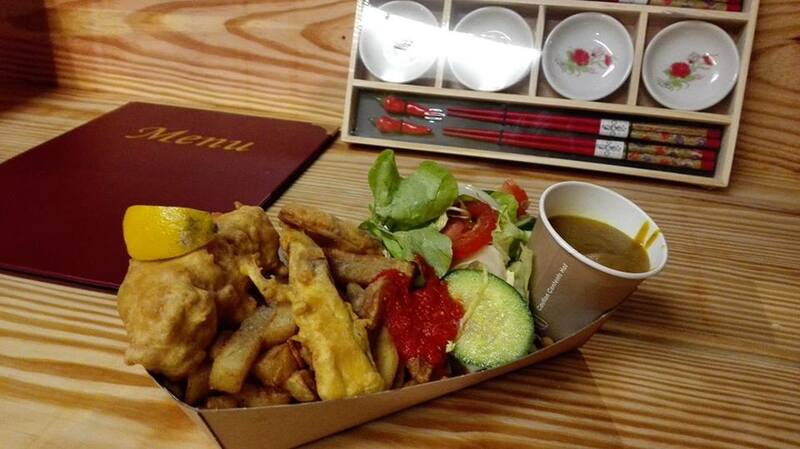 As well as Vx Bristol, the city is home to the UK’s first ever vegan fish and chip shop, Matter Fastfoods. This takeaway situated on Fishponds Road aims to make vegan, and healthier versions of fast food classics and promises a menu of organic and nutritious dishes which includes not only tofish and chips but also fried ‘cheekin’, battered sausuage, falafel, stir fries and other wok dishes, chili tobeef, and a delicious array of desserts including banana fritters, raw vegan cheese cakes and homemade super chocolate. “Tasty, affordable, nutritious and satisfying”, say Matter – and their food certainly sounds it. While less overtly junky than their vegan neighbours BurgerLolz, Sheffield’s Make No Bones deserve an honourable mention as they have several fast food options available on the menu – including a fishcake and mushy pea butty and the ‘surf and turf’ – featuring BBQ seitan ribs, scampi, and a creamy potato salad and blue cheese dip. Make No Bones say that they serve food for people who love animals and love to eat – which definitely sounds like just the right place for us! Temple of Seitan is famous for its fried vegan chicken and iconic name and branding. The hip restaurant boasts that it’s 100% guaranteed vegan fast food and the menu choices do little to contradict that statement. Here you can order burgers, hot wings, wraps, popcorn bites, chips, coleslaw, gravy and mac n’ cheese. All 100% plant based and 100% indulgent. If your fast food eatery of choice in the past was KFC, think TOS nowadays! Continuing with the theme of fried chicken, Vegan Fried Chicken in Leeds is a small pop up based at the cooperatively run social club Wharf Chambers and boasts one of the funniest tag lines of any fast food place around: “Not As Fowl As It Looks!” VFC is obviously a specialist in vegan fried chicken, but they also serve everything from vegan chicken curry and dumplings to their latest specials: sausage rolls and chicken leg balls, which are balls of vegan chicken wrapped in soya skin. Fat Gay Vegan reviewed this place for his blog back in December of last year and stated that he enjoyed it so much he was going back for more. Well, it it’s good enough for FGV then it’s good enough for us. Zads is an all vegan ‘guilt free takeaway’ in a village in South Manchester. They describe themselves as a “game changing fast food restaurant, for an ethical generation, who care about their health and the world in which we all live.” The place certainly has a strong reputation in the area and it’s not surprising when they offer the cheesiest and most topped pizzas around! My personal favourite is The Revolution, but equally good are the Hawaiian and the Pig Save Pizza, of which 50p from each pizza is donated to local animal save groups or vegan charities. Zads also boasts garlic breads, burgers, hot dogs, fries, curly fries, onion rings, chicken nuggets and an ever-changing dessert menu. What is particularly cool about Zads is that the majority of the staff are animal activists and members of groups such as Manchester Animal Action. One of Liverpool’s oldest pubs recently transformed itself recently into a vegan paradise with a completely plantbased food menu, as well as drinks that are vegan-friendly, too. The pub only has one type of animal on its premises – dogs! In fact the dog-friendly pub has developed a reputation for being a place where you can take your canine friend while you enjoy a pint or two. You can even get a (hopefully non-alcoholic!) beer for your dog. Back to human food choices now and The Caledonia serves a huge range of vegan fast food options, from seven different types of burgers and a range of long doggos, to chicken wings, all day breakfasts, sides like jalepeno poppers, potatoes three ways, mac n’ cheese, fries and gravy and onion rings. Desserts are either a frozen cookie sandwich, cake of the day or or a Jar of Joy. A children’s menu and a gluten free menu is also available. We hope that the above list has made your stomach grumble in the right ways and like always, please feel free to add your favourite vegan junk food restaurant options in the comment section below! Hi, has anybody tried https://www.suttonandsons.co.uk/vegan It is in London, so a long way for me to do, but I would like to know what people think of it. Next ArticleVegan 'death threats': show them, report them, or shut up!